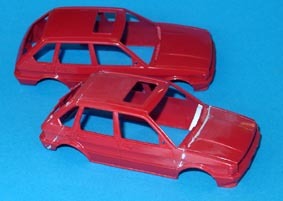 More difficult than it first seemed is converting the Scalextric MG Maestro, at least if you are pedantic! My dad had one of the very first Austin Maestro Van Dan Plas (the first UK car to talk to you, do any of them still speak I wonder?) so I thought a simple repaint was the order of the day.However, although the Scalex shell is a very good representation there is something wrong with it somewhere. It looks too long and on investigation of photographs (and taking a tape measure to a rusty one in a car park) the gap between the front arch and the door is way too large and the rear overhang is too long. JAK thinks the wheel arches just need moving (probably originally moved by Scalex to fit in with standard chassis dimensions) but I've gone with cutting a section out front and rear and re fixing. Luckily I managed to pick up a few bodyshells at a swapmeet so have room to experiment. Shortened shell at front compared to original behind. At the front it is better to utilise the rear edge of the bonnet rather than trying to re match it in the middle. I used a Bare Metal Foil panel line scriber to keep scribing untill I broke through. The wings were cut through at an angle (to miss the wheel arch) and then a parallel cut was made about 2mm further forward on the wings and a similar amount cut from the rear of the bonnet maintaining its shape. If done carefuly and equally it should all line up. Luckily the side scallops don't taper so the only mismatch is a very slight step on the top of the wings. I reinforrced the inside with plastic card and very little filling was required. I have filled the bonnet rear gap and will re scribe it. The same technique was applied at the rear end although slightly less was cut out. In actual fact I probably removed too much from the front end but it looks better with slightly too little gap between the door and the arch than with way too much. Obviously if intending to slot race the chassis will have to be shortened by a similar amount but really a cut and shut shell will never be strong enough for more than parade laps. 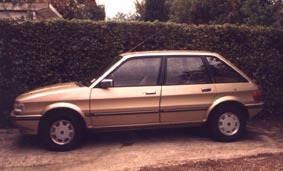 Incidently if you need a chassis for a standard Maestro (there are a few of these shells around at the moment) the XR3 is identical and you could fit one with working lights, I have in the past. It will help to play down the still slightly wrong rear overhang to put a much shallower slope onto the underside of the bumper, I don't know about the real MGs but the VDP ones are near to 45 degrees whereas the Scalex ones are about 70 - 80 degrees. There is no material behind the bumper so some would have to be added to allow reshaping however I will probably use the same hot wire technique as use on the Capri conversion. Sunroof has since been filled in and it should be straight forward from here. I will make some headlights from Perspex but will probably have to make copies of the grill and tail lights from my one complete standard car unless someone can supply me with a spare set. Again, the supply of a Scalex window unit would be a great help, although this too will have to be shortened, otherwise its vac form time again. Yet to find any suitable wheels so standard Scalex MG hubs (very good likeness and MG alloys were standard on later VDPs) will do for now. Interior will have to come from the bits box if I can find anything suitably 80s looking.